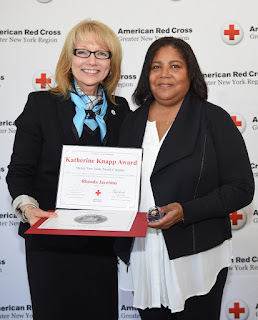 In honor of National Volunteer Week, we will be highlighting some of the award winners from our recent volunteer recognition events in Metro New York North, Long Island, and New York City. 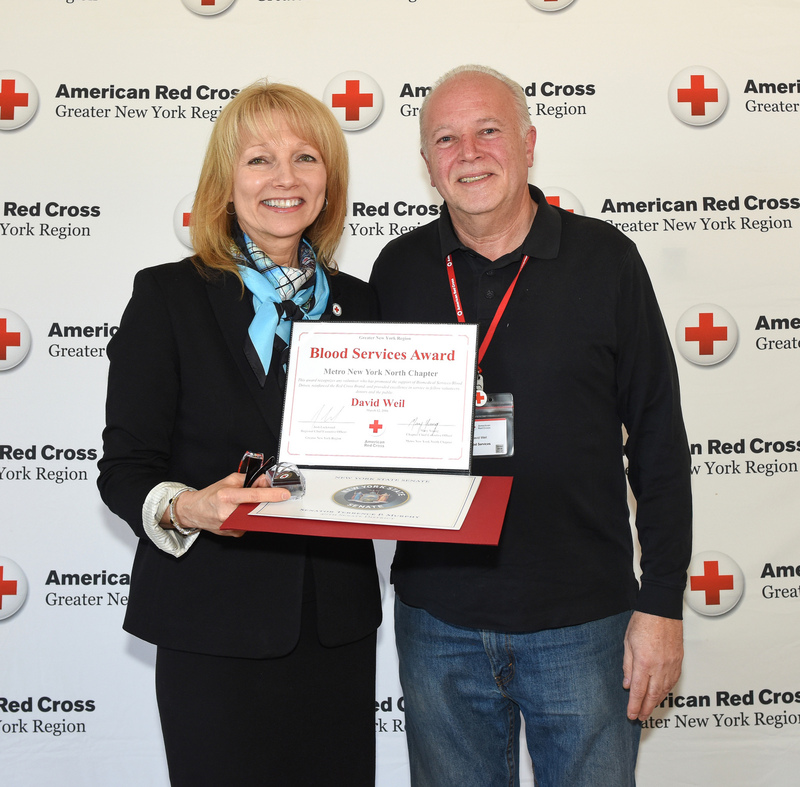 Today we look at two of our Metro New York North winners, David Weil, and Rhonda Jacobius. What first motivated you to become a Red Cross Volunteer? David Weil: My parents were both very active in humanitarian endeavors, so growing up with people who “walked the walk” certainly influenced me. I was an “activist” in my own right in my early childhood, so finding an outlet to “give back” was important to me. Red Cross was a good fit at this stage of my life. What volunteer activities do you find most satisfying? DW: Since I still work full time, my time is limited, so I found the structured schedule of Blood Services best suited to my availability. The fact that I’m a pretty social person made the Blood Drive volunteer detail a perfect complement to my personality. What are some of the major activities you are currently working on? DW: Where Red Cross is concerned, I have no major activities as such. My tasks involve changing signage as necessary in two community locations, and participating in as many Blood Drives as possible at registration or canteen. Outside of Red Cross, my time is presently consumed planning and organizing my 50th High School Reunion in 3 weeks. What would you say to someone who is thinking of becoming a Red Cross Volunteer? DW: The satisfaction and gratification are self-evident once you get involved. Everyone has a responsibility to do something to “give back” in their community, and the Red Cross mission is a deserving option. Get involved and experience the instant rewards. Rhonda Jacobius: Seven years ago I ran into an old friend who had been volunteering at his local Red Cross chapter for the previous 10 years and he told me how satisfying he found it. He was so enthusiastic about the Red Cross, I decided to give it a try myself. RJ: I like coordinating responder activities and getting involved in Mass Care plans. I find there is nothing more satisfying than direct client contact. RJ: Right now I am part of a Leadership Team for Mass Care training. I’m also training to be a Shelter Manager. RJ: If you want to make a positive difference in someone’s life, become a volunteer! There are many career paths to choose from and all of them lead to a feeling of great satisfaction!